Messy Good Times Ahead With Thomas & Friends® In Six Never-Before-Seen Adventures! "Sparks fly on the Island of Sodor as Thomas and his engine friends race around in these action-packed and slippery tales of friendship and fun, in Thomas & Friends®: Spills & Thrills available on DVD, Digital HD and Video on Demand March 4, 2014 from Lionsgate and HIT Entertainment. Featuring six exciting never-before-seen episodes, Thomas and his friends learn that even when mishaps happen, an adventure always awaits! All aboard for Spills & Thrills with Thomas and his friends! The Island of Sodor is always bustling with activity, yet when the engines try to be "Really Useful" they often find themselves in some messy muddles! James tries to prove he's not afraid of the dark, or too vain to haul smelly fish, but when he pulls the night time Kipper Express he gets more than he bargained for! Stephen's need for speed, and Salty's need to impress, sends them both into some sticky, slippery situations. Hiro shows Diesel that nice engines do finish first and Sir Topham Hatt shows you can't cry over spilled milk...twice! It’s full steam ahead for Spills & Thrills on Sodor!" Tell a fan of Thomas & Friends that you have a DVD with 6 new never before seen episodes, and word spreads like wild fire. I shared this with my nephew earlier this week when I received a screener copy of the upcoming Thomas & Friends Spills & Thrills DVD, and he went to school and shared the news with friends. As of last night, we have 8 boys coming to our house this weekend to have a Thomas & Friends screener party. Shh, don't tell my nephews friends, but he couldn't wait for them to see it, and ended up watching all 6 episodes with my girls, who are also huge Thomas & Friends fans. Who knew that a DVD could get kids so excited, as this one did. From the start of the DVD, right to the ending credits, they were running around the house in excitement. And, if new episodes weren't enough to spark our kids' attention, an addition of a new engine named Porter was. I tried to ask the kids which of the six episodes was their favorite, but they all agreed that they were all great and worth watching again and again. :-) Each episode will teach children about the importance of friendship, following instructions, working together and never giving up, as Thomas and his friends complete specials and show that they are really useful engines on the island of Sodor. While my nephew has already seen this DVD, I know he will be just as excited when his friends come this weekend to watch this DVD with him. We held off on watching the bonus features until the weekend, but know that they will be just as entertaining as the never before seen episodes. The bonus features include a fun music video, Guess Who? puzzle and even a Biff Bash Bosh Game, which my nephew is eager to play. So, if you have a Thomas & Friends fan in your house, you will want to pre-order or make a point to pick up this upcoming DVD release when it hits store shelves on March 4th. Or, if you are starting to pick up Easter basket gifts, this would make for a great surprise on Easter morning. Print out and share this fun Thomas & Friends coloring sheet with your child. And, make sure to make a few extra copies to have on hand for rainy days or to bring along when you dine out or need to run errands and keep the kids entertained. 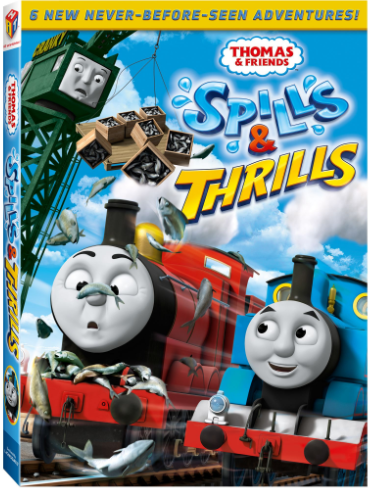 Thanks to the kind folks at HIT Entertainment and Lionsgate Home Entertainment, one lucky reader will win a copy of the upcoming Thomas and Friends: Spills & Thrills DVD release to enjoy with their child(ren). To enter, please complete the entries on the Rafflecopter form below. Good luck! i want to win this for myself, because i am a huge fan of thomas and friends, because theyre awesome and colorful. my favorite characters are henry, gordon, and the 18 diesels on sodor. i want to win this for myself and my favorite characters are henry, gordon, and the 18 diesels on sodor. i love thomas and friends, because theyre awesome and colorful.